Our screening was sponsored by the Centre for Teaching Asian Languages at Deakin. Program Coordinator Shannon Cheale and Centre Director Alex Kostogriz were the perfect hosts, providing refreshments for guests and even giving us these Deakin scarves following the screening. These already have come in handy as the weather has gotten dedicedly cold in Melbourne and Canberra. Shannon even drove us back to the city following the screening, which was useful since the tram ride takes an hour! One of the comments that we’ve been receiving in Australia has been whether or not we’ve screened the film in any Asian countries, such as China, Singapore, Taiwan or Hong Kong. It’s definitely in our plans, though our focus to-date has been on English-speaking Western nations. That said, I think these Asian countries would appreciate seeing a Western-interpretation of their beloved national heroine. 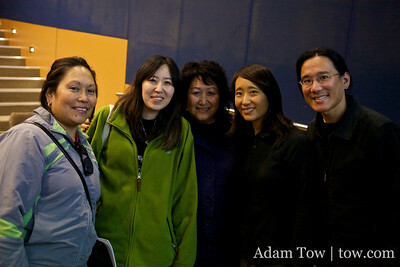 We hope that 2011 will bring about a full Asian tour of Autumn Gem! Here are photos from our Deakin University screening.